Lord Williams preaching to an array of Cardinal, Catholic, Anglican and Orthodox bishops at Westminster Abbey. Some 1300 attended the service. Lord Rowan Williams, the former leader of the Church of England, delivered the sermon at a special Evensong commemorating the centenary of the birth of Blessed Oscar Romero at Westminster Abbey in London on Saturday September 23rd. Great Britain has historically maintained a close relationship with Romero. It was members of the British Parliament who nominated Romero for the Nobel Peace Prize in 1979. 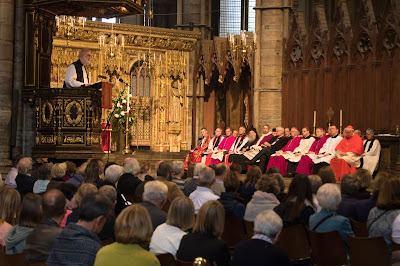 When the installation of Robert Runcie as Head of the Anglican Communion on March 25, 1980 coincided with Romero’s assassination, Canterbury Cathedral became the first major church to foster a devotion and admiration for the Salvadoran martyr. Runcie and John Paul II commemorated Romero when the Pope visited Canterbury in 1982. The nearby Catholic Church in Canterbury now houses Romero relics in the form of a stole and an alb. In 1998, Romero’s statue was installed at Westminster Abbey. In 2013, a Romero relic was installed in St. George’s (Catholic) Cathedral in Southwark (London). In 2015, a Romero statue was installed in St. Albans (Anglican) Cathedral. In 2017, a Romero bust was installed in Liverpool’s (Catholic) Cathedral. Almost exactly forty years ago, on the 25 September 1977, Archbishop Oscar Romero in his weekly mass homily provided an extended and more theological version of that comment. 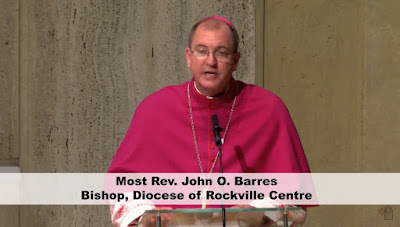 He reflected in this homily on the biblical notion of property. Property, he said, in Jewish and Christian Scripture, was something that was lent to the user. Never absolutely given. Always to be used, rented from God. And so, he says, the truth is that the rich pay to the poor the rent for the land whose use they are given for a time. In a just world, that is how we should conceive property. We are given something through which we are set free to discharge our debt to the poor. Because if our God is with the poor, then when we serve the poor, we serve God. When we recognize our indebtedness to the poor, we pay our rent to God for the land we use. And in that perspective, he goes on to say, we are all of us beggars together. No one simply owns at another’s expense. Everyone is caught up in exchange. Those who are wealthy – in this world’s terms – are those who have been given the privilege of using the things of the world for the flourishing of their neighbor. Beggars together we become rich together. And we are delivered from the imprisoning falsehood of supposing that the world is something we can own, whether as individuals, as societies, or even as the human race collectively. What is given is given to be given. What did he leave? Everything. Nothing can be stored against that final reckoning. And we should get used now to the call of God to serve, to pay our debt to the needy. It’s an unexpected echo of one of the great insights of that father of the English Reformation, William Tyndale, who spoke in his own reflection on the gospels of the debt that the wealthy owe to the wretched. We live in a world where it seems that the wretched are reminded constantly of their debt to those who are already wealthy. But, as Jesus says in the gospel about the use of power and resource, it shall not be so among you. And the gospel promises liberation from that myth of ownership and control, that apparently relentless pattern of accumulating resources and not sharing. Which is why, later in the same year, when Archbishop Romero preaches about slavery and freedom, he describes the freedom of those who have heard the gospel in terms precisely of a freedom from the slavery of seeking possession. We are possessed, we are enslaved, by the myth that we can possess the world for ourselves alone. And our true liberation comes when we understand that opening our hands, sharing what we have, is how liberation manifests itself. Christ does not want slaves, says Romero. He wants us all, rich and poor, to love one another as sisters and brothers. He wants liberation to reach everywhere so that no slavery exists in the world, none at all. No person should be the slave of another, nor a slave of misery, nor a slave of anything. This is the content of revelation, this doctrine, this evangelization. It’s easy to see from that quotation why it is that Romero believed that our liberation immediately projected us into a deeper level of community. Because once that mythology of possessing and being possessed has disappeared, we are free for one another in a quite new way. And what happens then is community. A community in which we are creating freedom for one another, day after day, in which we, liberated from myth and slavery, from fiction and oppression and injustice, are set free to feed and nourish each other’s humanity to the full. And the responsibility of every baptized person, so Archbishop Romero insists again and again, is a responsibility to create freedom. We are not only recipients of liberation, but agents. Not only those who let themselves be fed, by the grace of God and the grace of their neighbor, but those who have the power and authority to feed, to nourish, to set free. In life and in death, Blessed Oscar Romero paid his debt to the poor. In every word he spoke, in every encounter in which he was involved, he saw his responsibility as that of an agent of God’s liberation, challenging day-by-day and week-by-week, in his letters, his sermons, his public addresses, the death-dealing fiction which kept his entire society in slavery. Addressing the gross injustice and inequality of the land-owning system in his country. Addressing the barbaric violence that supported that system, and eventually claimed his own life. He would have been grieved, but perhaps not surprised, to know that that inequality and that barbaric violence is still a feature of so many countries in Central and South America to this very day. And our prayers must today be with those who continue his work, in costly witness, in speaking the truth. He himself describes elsewhere the Church itself as above all an agent of truth in an environment of myth and lies. But we should always remember the stress which he laid upon the idea that the poor were to take their own agency, their own responsibility. Rather than simply talking about a Church for the poor, Archbishop Romero was one of those who genuinely understood what it might be for the Church to be a Church of the poor. A Church where the dispossessed and the wretched found their dignity and their agency, their capacity to make a difference. Liberation is not something we receive only, but something of which we become agents. We baptized into Christ, we become agents of that Christ-like, that Christ-shaped gift of bringing liberation. And that’s why in yet another sermon from this year, from 1977, Archbishop Romero can speak – as he often speaks very eloquently – of the Eucharist, the mass, as the place where reparation, restoration, the healing of breaches, the overcoming of inequality, is all taking place. We offer the Eucharist in Christ as a means of peace-making. We offer it, recognizing the debt we owe not simply to God, but to one another. And we celebrate the Eucharist, truly effectively with integrity, when that is our goal, when the liberated community shows itself capable of sharing freedom, setting one another free. In a particularly moving passage, Archbishop Romero speaks of how this approach to the Eucharist is a way of restoring what he calls the beauty of the Church. He speaks of the way in which that essential beauty of unconditional divine love takes flesh again and again in the Eucharistic body, in the community gathered at the mass. Beauty is a strange word, sometimes, to use of the Church. And beauty is a strange word to bring to mind for anyone who has ever seen the photographs of Archbishop Romero’s body, riddled with bullets, and streaming with blood. But to recognize his life and death as something which itself served that Eucharistic beauty of the Church is to recognize that without that commitment to liberation, to that act which frees us from the slavery of myth and fiction, the Church is ugly, the Church is disfigured, it fails to show what it most truly is. By God’s grace, in the Sacrament of the Eucharist, we glimpse fleetingly what it might be for the Church to radiate the beauty of God in justice, in reconciliation and reparation. We, striving to make that real in our own discipleship, are committed to that vision of the Church’s beauty, painfully, hauntingly aware of what that might mean in terms of risk for its witnesses. We are beggars together, and when we have recognized that, liberation begins to come alive. When liberation begins to become alive we become people who in Christ are enabled to set one another free. When we begin to set one another free, we move into the fullness of community. When we move into the fullness of community, we show the beauty of God’s act in Christ, and God’s continuing act in the Church. In giving thanks for the life and the martyrdom of Blessed Oscar Romero, we ask ourselves how far we are still enslaved by the myth of possessing and being possessed. What is the level of our own willingness to be beggars together? The level of our own willingness not only to be set free, but to be agents of freedom? We look with thanksgiving to one of Christ’s great servants, who stands with us in the everlasting communion of saints, who stands with us at the Eucharistic table of Jesus Christ, who calls us as his blood is shed, to be – with him – agents of the beauty of God’s people, renewing the face of the earth. Lord Williams predicando a un surtido de cardenales, católicos, anglicanos y obispos ortodoxos en la abadía de Westminster. Unos 1300 asistieron al servicio. Lord Rowan Williams, ex líder de la Iglesia Anglicana, pronunció el sermón en un canto de las vísperas en la Abadía de Westminster en Londres para conmemorar el centenario del nacimiento del beato Óscar Romero el pasado sábado 23 de septiembre. Gran Bretaña ha mantenido históricamente una estrecha relación con Romero. Miembros del Parlamento británico postularon a Romero para el Premio Nobel de la Paz en 1979. Cuando la instalación de Robert Runcie como jerarca de la Comunión Anglicana el 25 de marzo de 1980 coincidió con el asesinato de Romero, la Catedral de Canterbury se convirtió en la primera iglesia importante en fomentar una devoción y admiración por el mártir salvadoreño. Runcie y Juan Pablo II conmemoraron a Romero cuando el Papa visitó Canterbury en 1982. La iglesia católica cercana en Canterbury ahora contiene reliquias de Romero en la forma de una estola y de una alba. En 1998, la estatua de Romero fue instalada en la Abadía de Westminster. En 2013, una reliquia de Romero fue instalada en la catedral de St. George (católica) en Southwark (Londres). En 2015, se instaló una estatua de Romero en la Catedral de St. Albans (anglicana). En 2017, un busto de Romero fue instalado en la catedral (católica) de Liverpool. Casi exactamente cuarenta años atrás, el 25 de septiembre de 1977, el arzobispo Óscar Romero proporcionó una versión ampliada y más teológica de ese comentario en la homilía de su Misa semanal. Reflexionó en esta homilía sobre el concepto bíblico de la propiedad. En las Escrituras judías y cristianas - dijo - la propiedad, venía prestada al usuario. Nunca era dada en absoluto. Siempre debería ser utilizada, alquilada de Dios. De esa manera, dice, la verdad es que los ricos pagan a los pobres la renta por la tierra cuyo uso se les presta por un dado tiempo. En un mundo justo, así es como debemos concebir la propiedad. Se nos da algo a través del cual quedamos libres para cumplir nuestra deuda con los pobres. Porque si nuestro Dios está con los pobres, entonces cuando servimos a los pobres, servimos a Dios. Cuando reconocemos nuestro endeudamiento con los pobres, pagamos nuestra renta a Dios por la tierra que usamos. Y en esa perspectiva, continúa diciendo, todos somos mendigos juntos. Nadie simplemente posee a expensas de otro. Todos estamos inmersos en esa interacción. Aquellos que son ricos—en este mundo—son quienes se les ha dado el privilegio de usar las cosas del mundo para el bien de su prójimo. Siendo mendigos juntos nos enriquecemos juntos. Y somos liberados de la falsedad encarceladora de suponer que el mundo es algo que podemos poseer, ya sea como individuos, como sociedades, o incluso colectivamente como raza humana. Lo que se da es dado para ser dado. ¿Qué dejó? Todo. Nada se puede almacenar contra el juicio final. Y debemos acostumbrarnos ahora al llamado de Dios para servir, para pagar nuestra deuda a los necesitados. Es un eco inesperado de una de las grandes ideas de aquel padre de la Reforma inglesa, William Tyndale, que habló en su propia reflexión sobre los evangelios de la deuda que los ricos deben a los miserables. Vivimos en un mundo donde parece que a los miserables se les recuerda constantemente su deuda con los ricos. Pero, como dice Jesús en el evangelio sobre el uso del poder y de los recursos, no será así entre vosotros. Y el evangelio promete liberarnos de ese mito de propiedad y control, ese patrón aparentemente implacable de acumular recursos y no compartirlos. Por eso, en el mismo año, cuando Monseñor Romero predica sobre la esclavitud y la libertad, describe la libertad del evangelio precisamente en términos de una libertad de la esclavitud de querer siempre buscar la posesión. Estamos poseídos, somos esclavos, del mito de que podemos poseer el mundo para nosotros solos. Y nuestra verdadera liberación viene cuando comprendemos que abrir nuestras manos, compartir lo que tenemos, eso es liberación. Cristo no quiere esclavos, dice Romero. Él quiere que todos nosotros, ricos y pobres, nos amemos unos a otros como hermanos y hermanas. Quiere que la liberación llegue a todas partes para que no haya esclavitud en el mundo, ninguna en absoluto. Nadie debe ser esclavo de otro, ni esclavo de la miseria, ni esclavo de nada. Este es el contenido de la revelación, esta doctrina, esta evangelización. Es fácil ver en estas palabras por qué es que Romero creía que nuestra liberación nos proyectaba de manera directa hacia un nivel más profundo de comunidad. Porque una vez que la mitología de poseer y ser poseído ha desaparecido, quedamos libres uno para otro de una manera totalmente nueva. Y lo que resulta entonces es una comunidad. Una comunidad en la que estamos creando la libertad unos para otros, día tras día, en la que liberados del mito y de la esclavitud, de la ficción, de la opresión y de la injusticia, quedamos libres para sustentar y alimentar la humanidad del otro. Y la responsabilidad de todos los bautizados, insiste Monseñor Romero una y otra vez, es la responsabilidad de crear libertad. No somos sólo receptores de la liberación, sino que agentes de ella. No somos sólo personas que se dejan alimentar, por la gracia de Dios y la gracia de su prójimo, sino los que tenemos el poder y la autoridad de alimentar, nutrir, liberar. En la vida y en la muerte, el beato Óscar Romero pagó su deuda con los pobres. En cada palabra que hablaba, en cada encuentro en que participaba, veía su responsabilidad como la de un agente de la liberación de Dios, desafiando día a día y semana por semana, en sus cartas, sus sermones y discursos públicos, la ficción mortífera que mantenía a toda su sociedad en esclavitud. Abordó la injusticia flagrante y desigualdad del sistema agrario de su país. Abordó la violencia bárbara que sostenía ese sistema, y que ​​finalmente reclamó su propia vida. Estaría consternado, pero tal vez no sorprendido, de saber que esa desigualdad y esa violencia bárbara sigue siendo una característica de tantos países de América Central y América del Sur hasta hoy día. Y nuestras oraciones deben ser hoy para aquellos que continúan su trabajo, de testimonio costoso, para hablar la verdad. Él mismo describe en otra parte la propia Iglesia como, sobre todo, un agente de la verdad en un ambiente de mitos y mentiras. Pero debemos recordar siempre el énfasis que hizo sobre la idea de que los pobres tomarían su propia agencia, su propia responsabilidad. En lugar de hablar simplemente de una Iglesia para los pobres, Monseñor Romero fue uno de los que realmente entendieron lo que podría ser si la Iglesia fuera una Iglesia de los pobres. Una Iglesia donde los desposeídos y los miserables encuentran su dignidad y su agencia, su capacidad de hacer la diferencia. La liberación no es algo que sólo recibimos, sino algo de lo que nos convertimos en agentes. Los bautizados en Cristo, nos convertimos en agentes de ese don, semejante a Cristo y hecho por Cristo, de traer liberación. Y es por eso que en otro sermón de este año, de 1977, Monseñor Romero habla—como él suele hacer muy elocuentemente—de la Eucaristía, la Misa, como el lugar donde se lleva a cabo la reparación, la restauración, la curación de las brechas, la superación de la desigualdad. Ofrecemos la Eucaristía en Cristo como un medio para hacer la paz. Lo ofrecemos, reconociendo la deuda que no debemos simplemente a Dios, sino también a los demás. Y celebramos la Eucaristía, verdaderamente con integridad, cuando esa es nuestra meta, cuando la comunidad liberada se muestra capaz de compartir la libertad, liberándose unos a otros. En un pasaje particularmente emotivo, Monseñor Romero habla de cómo esta forma de idear la Eucaristía ayuda a restaurar lo que él llama la belleza de la Iglesia. Habla de la manera en que esa belleza esencial del amor divino incondicional se encarna una y otra vez en el cuerpo eucarístico, en la comunidad reunida en la Misa. Belleza puede parecer una palabra extraña para usar de la Iglesia. Y la belleza es una palabra extraña para tener en mente a quien haya visto alguna vez las fotografías del cuerpo de Monseñor Romero, perforado por balas y cubierto de sangre. Pero reconocer su vida y su muerte como algo que sirvió a la belleza eucarística de la Iglesia es reconocer que sin ese compromiso de liberación, con ese acto que nos libera de la esclavitud del mito y la ficción, la Iglesia parece fea, la Iglesia queda desfigurada, no muestra lo que realmente es. Por la gracia de Dios, en el Sacramento de la Eucaristía, vislumbramos fugazmente lo que podría ser para la Iglesia irradiar la belleza de Dios en justicia, reconciliación y reparación. Cuando nos esforzamos para que esto sea real en nuestro propio discipulado, nos comprometemos con esa visión de la belleza de la Iglesia, dolorosamente conscientes de lo que eso podría significar en términos de riesgo para sus testigos. Somos mendigos juntos, y cuando lo hemos reconocido, la liberación comienza a cobrar vida. Cuando la liberación comienza a cobrar vida, nos convertimos en personas que están capacitadas en Cristo para liberarnos unos a otros. Cuando comenzamos a liberarnos unos a otros, nos movemos hacia la plenitud de una comunidad. Cuando nos movemos hacia la plenitud de una comunidad, mostramos la belleza del actuar de Dios en Cristo y el actuar continuo de Dios en la Iglesia. Al dar gracias por la vida y el martirio del beato Óscar Romero, nos preguntamos hasta qué punto somos esclavizados por el mito de poseer y ser poseídos. ¿Cuál es el nivel de nuestra propia voluntad de ser mendigos juntos? ¿El nivel de nuestra voluntad no sólo para ser liberados, sino para ser agentes de la libertad? Miramos con gratitud a uno de los grandes siervos de Cristo, que está con nosotros en la eterna comunión de los santos, que está con nosotros en la mesa eucarística de Jesucristo, que nos llama con su sangre derramada, a ser—con él—agentes de la belleza del pueblo de Dios, para renovar la faz de la tierra. (in the Christian Church) a service of evening prayers, psalms, and canticles, conducted according to a set form, especially that of the Anglican Church. 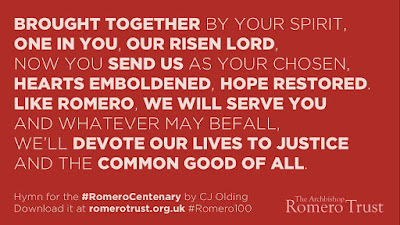 Portion of the hymn published by the Romero Trust. Across the pond on the same day, the Catholic Church will recognize another of its sons killed in the political turmoil of Central America in the 1980s as a martyr, when it beatifies Fr. Stanley Rother, assassinated by rightwing paramilitaries in 1981. The new blessed has the distinction of being the first U.S.-born martyr—though perhaps not the last to have laid down their lives in the service of Central Americans, if the U.S. churchwomen killed in El Salvador in the same year are someday beatified as martyrs. Blessed Oscar Romero and Blessed Stanley Rother, pray for us! A few weeks ago on Long Island, where I became the bishop in January, we were visited by Cardinal Gregorio Rosa Chavez of El Salvador. Cardinal Rosa Chavez was a close friend and right hand of El Salvador’s courageous archbishop and martyr, Oscar Romero, who was murdered in 1980 while celebrating Mass in a hospital caring for the terminally ill. He was assassinated minutes after he had summoned soldiers conscientiously to obey God in respecting the human dignity of their neighbors rather than follow the directives of government and military leaders ordering them to violate their neighbors’ human rights through torture, slaughter and other evils. Cardinal Rosa Chavez and I jointly made an appeal for comprehensive immigration reform in this country and globally, grounding that appeal in the principles of the dignity of the human person, human life and the family, and in the social justice practice of going to the roots of social problems and systematically addressing poverty. We also appealed to gang members on Long Island and throughout the United States, who are enmeshed in the evil of human trafficking and drug cartels, to reject the culture of death and dehumanization and embrace a culture of life and love. Archbishop Romero was executed because he would not bend in this defense of the intrinsic value of the lives of all people, especially the poorest and most marginalized. His message in support of life and dignity has never faded but instead has become louder and more powerful with every passing year. How moving it was that in March 2015, to mark the 35th anniversary of his death, there was a stunning exhibition at the Curved Wall of the UN Conference Building detailing his life, work and martyrdom, and illustrating how his example of service and leadership in the cause of human dignity continues to shine as a summons for all peoples of the world to emulate. Archbishop Romero — like the heroes of 9/11, like so many agents of the United Nations who give their lives to travel into areas of war and abject poverty to save lives or provide them with a better life — is one in a firmament of bright stars illuminating the world’s darkest nights and indicating to us all the path to personal fulfillment through lifting others up. He humbly shows us how to focus on people and strive effectively for peace and a decent life for all. As we come together tonight in prayer on the vigil of the beginning of the 72nd session of the General Assembly of the United Nations, we ask God to bless the efforts of all those associated with the UN to advance human dignity and the human rights that flow from it, to protect us and the world from the scourge of war and environmental destruction, and to lift up all those who are on the margins. We ask him to bestow on us wisdom, prudence, perseverance and integrity, to give us courage not to give up when we encounter obstacles and mercifully to draw long-term good even from our failures. We ask him in a special way to grant the leaders and all those who work at or for the United Nations, the gift of compassion and passion, so that, like Archbishop Romero, hearing the cries of the poor, needy and abandoned, they may live up to the high hope the peoples of the world place in them and, indeed, lead the way to a more united, fraternal, just and merciful world. May God bless you all and help you bring great fruit from the 72nd Session that begins tomorrow. Hace unas semanas en Long Island, donde asumí como obispo en enero, tuvimos una visita del cardenal Gregorio Rosa Chávez de El Salvador. El cardenal Rosa Chávez fue un amigo cercano y mano derecha del valiente arzobispo y mártir de El Salvador, Óscar Romero, que fue asesinado en 1980 mientras celebraba misa en un hospital para enfermos terminales. Fue asesinado minutos después de haber instado a los soldados a obedecer conscientemente a Dios en el respeto de la dignidad humana de sus prójimos en lugar de acatar directrices del gobierno y líderes militares ordenándolos a violar los derechos humanos de los demás mediante la tortura, la matanza y otras fechorías. El cardenal Rosa Chávez y yo hicimos conjuntamente un llamamiento a una reforma migratoria integral en este país y a nivel mundial, fundamentando ese llamamiento en los principios de la dignidad de la persona, la vida humana y la familia y en la práctica de la justicia social que va a las raíces de los problemas sociales y de abordar sistemáticamente la pobreza. También hicimos un llamamiento a los pandilleros de Long Island y por todo los Estados Unidos, que se integran a las redes del tráfico humano y de los cárteles que exportan droga, a rechazar la cultura de la muerte y la deshumanización y retomar la cultura de la vida y del amor. Monseñor Romero fue asesinado porque no se doblegó en la defensa del valor intrínseco de la vida de todas las personas, especialmente de los más pobres y marginados. Su mensaje en favor de la vida y de la dignidad nunca ha desaparecido, pero al contrario se vuelve más fuerte y más poderoso cada año. Qué conmovedor ha sido tener en marzo de 2015, con motivo del 35 aniversario de su muerte, una impresionante exposición en el Muro Curvo del Edificio de la Conferencia de las Naciones Unidas, en la que se detallaba su vida, su obra y su martirio, ilustrando que su ejemplo de servicio y liderazgo en la causa de la dignidad humana sigue brillando como una convocatoria que todos los pueblos del mundo deben emular. Monseñor Romero—como los héroes del 11-S, como tantos agentes de las Naciones Unidas que dan su vida para llegar a zonas de guerra y pobreza abyecta para salvar vidas o darles una vida mejor—es una de las estrellas brillantes en el firmamento que iluminan las noches más oscuras del mundo y nos indica el camino hacia la realización personal levantando a los demás. Él nos enseña humildemente cómo fijarnos en las personas y esforzarnos eficazmente por la paz y por una vida decente para todos. Al reunirnos esta noche en oración en la vigilia del comienzo de la 72ª sesión de la Asamblea General de las Naciones Unidas, pidamos a Dios que bendiga los esfuerzos de todos los asociados con la ONU para promover la dignidad humana y los derechos humanos que fluyen para protegernos a nosotros y al mundo del flagelo de la guerra y la destrucción del medio ambiente, y para levantar a todos los que están al margen. Pidámosle que nos conceda la sabiduría, la prudencia, la perseverancia y la integridad, que nos dé el valor de no darnos por vencidos cuando nos encontremos con obstáculos y, misericordiosamente, de sacar bien a largo plazo incluso desde nuestros fracasos. Le pedimos de manera especial que conceda a los dirigentes ya todos los que trabajan para las Naciones Unidas, el don de la compasión y de la pasión para que, al igual que Monseñor Romero, al oír los gritos de los pobres, necesitados y abandonados, puedan estar a la altura de la esperanza que los pueblos del mundo depositan en ellos y, de hecho, abrir el camino a un mundo más unido, fraterno, justo y misericordioso. Que Dios los bendiga a todos y los ayude a traer grandes frutos de la 72ª Sesión que comienza mañana. 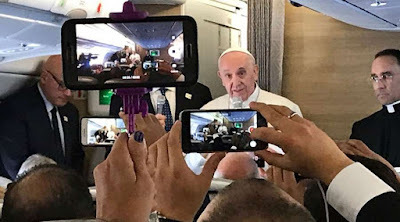 Vatican reporter Massimo Faggioli joked over his Twitter feed, “Many Catholics are looking forward to the next in-flight press conference of Pope Francis.” He added the hashtag, “#DACA,” a reference to the recent action by the Trump Administration to end legal accommodations for young undocumented migrants, sure to be the subject of at least one question during the Pope’s return flight, when he customarily gives an on-board press conference (to the delight of Francis supporters and the chagrin of his detractors). It is precisely because of the opportunity for a frank exchange that these encounters offer that I hereby offer any Vaticanista who is open to it a suggested question about Oscar Romero they might ask the Pope during the return trip conference. The in-flight papal press conferences are opportunities to gain fresh knowledge or insight on pending canonization causes. It was during such an encounter ten years ago that Pope Benedict was asked about the Romero beatification. In the ninth question, toward the end of the conference, the correspondent from I. Media in France asked Benedict if, during that trip to “the Continent of Archbishop Oscar Romero,” he cared to comment on the status of the cause or “how you see this figure.” [See Video of the exchange—in Italian.] Benedict was remarkably candid in his response, saying that he had “no doubt” that Romero personally “merits beatification,” but that issues relating to the political implications still needed to be worked out. The unusual airing of the Pope’s personal views was expunged from the official transcript of the exchange. But the furtive endorsement arguably added new impetus to the cause. Similarly, when Francis was asked about the Romero cause during his flight back from Korea in 2014, it revealed the Vatican’s inside thinking not specifically about Romero but about the canonization process in general. By then, Romero was in the home stretch of his path to beatification. But Francis also said in response to the question from Reuters’ Philip Pulella, “What I would like is a clarification about martyrdom in odium fidei, whether it can occur either for having confessed the Creed or for having done the works which Jesus commands with regard to one’s neighbor. And this is a task for the theologians.” Earlier this year—nearly three years after the Pope’s remark—Francis announced a separate track for beatification for “those Christians who, following in the footsteps and teachings of the Lord Jesus, have voluntarily and freely offered their lives for others and have persevered until death in this regard”—more or less as he had telegraphed in 2014. Accordingly, it is in this latter spirit that I would frame a new question to Francis about Romero. The status of the Romero canonization cause is generally known, due to information made public by the Archdiocese of San Salvador and the postulator, Archbishop Vincenzo Paglia, establishing that Rome is in the process of studying a miracle which, if approved, could lead to Romero’s canonization in the next year or two. [More.] Therefore a question regarding the status of the cause would seem to me a wasted chance to glean fresh information. Instead, what could be more interesting is a question designed to prompt a Benedict-like personal reflection. Indeed, given the context of this visit, such question seems most appropriate. 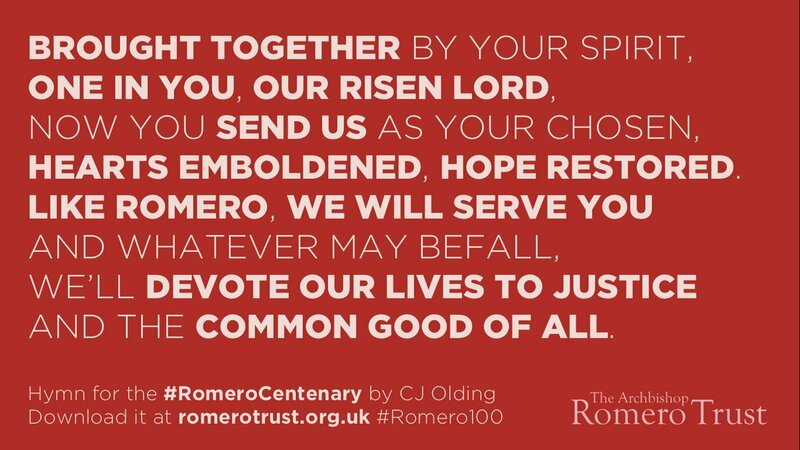 This year marks the 100th anniversary of Romero’s birth, and therefore it is natural to reflect on his legacy and the impact he has had on the Church. The day before he departs, Francis will visit Medellin, the Colombian city where the Latin American bishops’ conference adopted the phrase “the preferential option for the poor,” and the deep commitment to social justice that, for many, Romero exemplified. This year is also the tenth anniversary of the Aparecida Conference, which is seen as the blueprint for Francis’ pontificate, including his recommitment to being “a Church which is poor and for the poor,” as Francis has stated the formula. (That is where Benedict was going when he said that he had no doubt Romero deserved to be beatified; and Francis himself, as Cardinal Bergoglio, reportedly told Salvadoran clerics that if he were pope, the first thing he would do is canonize Romero.) Finally, the postwar climate in Colombia where the pope has been makes El Salvador a relevant point of reference. · In the centenary of his birth, how has Bl. Oscar Romero influenced the Church in the Continent, your own spiritual life and/or your Papacy? El periodista vaticano Massimo Faggioli bromeó en un mensaje de Twitter: “Muchos católicos están anticipando la próxima conferencia de prensa del Papa Francisco”. Añadió el hashtag “#DACA”, una referencia a la reciente acción de la administración Trump para cancelar los arreglos legales para los jóvenes inmigrantes indocumentados, que seguramente será el tema de al menos una pregunta durante el vuelo de regreso del Papa, cuando suele dar una conferencia de prensa a bordo (al deleite de sus partidarios y el disgusto de sus detractores). Es precisamente por la posibilidad de un intercambio franco que ofrecen estos encuentros que ofrezco a cualquier Vaticanista que esté abierto a ello una pregunta sugerida acerca de Mons. Óscar Romero que podrían preguntar al Papa durante la conferencia del viaje de regreso. Las conferencias de prensa en-vuelo de los papas son oportunidades para obtener nuevos conocimientos sobre las causas de canonización pendientes. Fue durante un tal encuentro hace diez años que alguien preguntó al Papa Benedicto sobre la beatificación Romero. En la novena pregunta, hacia el final de la conferencia, el corresponsal de I. Media de Francia le preguntó a Benedicto si, durante ese viaje al “continente de monseñor Óscar Romero”, gustaría comentar el estado de la causa o “cómo ve usted esta figura”. [Ver el Video—en italiano.] Benedicto XVI fue muy sincero en su respuesta, aseverando un “no dudo” sobre si Romero personalmente “merece la beatificación”, pero que las implicaciones políticas aun deberían ser investigadas. La expresión inusual de la opinión personal del Papa fue suprimida en la transcripción oficial del intercambio. Sin embargo, el respaldo efímero sin duda prestó un nuevo ímpetu a la causa. Del mismo modo, cuando se le preguntó a Francisco sobre la causa de Romero durante su regreso de Corea en 2014, reveló el pensar vaticano—no específicamente sobre Romero, sino en los procesos de canonización, generalmente. Para entonces, Romero estaba en el tramo final de su camino hacia la beatificación. Pero Francisco dijo en respuesta a la pregunta de Philip Pulella, de Reuters: “Lo que a mí me gustaría es que se esclarezca: si se da martirio in odium fidei, por haber confesado a Cristo o por haber hecho las obras que Jesús nos manda para con el prójimo. Y esto tienen que hacerlo los teólogos, que lo están estudiando”. A principios de este año, casi tres años después del comentario del Papa, Francisco anunció una nueva pista hacia la beatificación para “aquellos cristianos que, siguiendo más de cerca los pasos y las enseñanzas del Señor Jesús, han ofrecido voluntaria y libremente su vida por los demás y perseverado hasta la muerte en este propósito”—más o menos como lo había presagiado en el 2014. En consecuencia, es en este último sentido que plantearé una nueva pregunta para Francisco sobre Romero. El estado de la causa de canonización de Romero es generalmente conocido, debido a la información hecha pública por la Arquidiócesis de San Salvador y el postulador, Monseñor Vincenzo Paglia, estableciendo que Roma está en el proceso de estudiar un milagro que podría llevarnos a la canonización en el próximo un o dos años. [Más.] Por lo tanto, una pregunta sobre el estado de la causa me parecería una oportunidad perdida para recopilar información nueva. En cambio, lo que podría ser más interesante es una pregunta diseñada a impulsar una reflexión personal como lo hizo Benedicto. De hecho, dado el contexto de esta visita, tal pregunta parece más que apropiada. Este año se cumplen los 100 años del nacimiento de Romero, por lo que es natural reflexionar sobre su legado y el impacto que ha tenido en la Iglesia. El día antes de su partida, Francisco visitará Medellín, la ciudad colombiana donde la conferencia episcopal latinoamericana adoptó la frase “la opción preferencial por los pobres” y el profundo compromiso con la justicia social que, para muchos, Romero ejemplificó. Este año es también el décimo aniversario de la Conferencia de Aparecida, considerada como el modelo del pontificado de Francisco, incluso su compromiso de volver a ser “una Iglesia pobre y para los pobres”, como Francisco ha expresado la fórmula. (Ahí es donde Benedicto se dirigía cuando dijo que no tenía ninguna duda de que Romero merecía ser beatificado, y el mismo Francisco, siendo el cardenal Bergoglio, dijo a unos clérigos salvadoreños que si él fuera papa, lo primero que haría sería canonizar a Romero). Por último, el clima de posguerra en Colombia donde el Papa ha estado, hace de El Salvador un punto de referencia relevante. · En el centenario de su nacimiento, ¿cómo ha influido el B. Óscar Romero en la Iglesia del Continente, en su propia vida espiritual y / o en su papado?